Listen to me and Kirk McElhearn on our podcast. Click on a script's name and go its entry page for information and download link. How much of your valuable time has been saved using my scripts? Donations of any convenient size help pay the bills and defray my personal costs in keeping the site going. Making a contribution via PayPal is easy, safe, and secure. Future visitors salute you! A tweet is worth…well, I guess only 140 characters. But a picture of a tweet should be worth more, right? Anyway, this tweet from a Correspondent reminded me about something I’ve been aiming to do for a while and that’s find the folders in the iTunes Media folder that 1) are empty and that iTunes wouldn’t or couldn’t delete and 2) find the folders that are virtually empty except for any files that aren’t compatible with iTunes. Typically, if you allow iTunes to manage the iTunes Media folder, iTunes will remove “Artist” and “Album” folders when it happens that they become empty by virtue of deleting tracks and their files in the app. 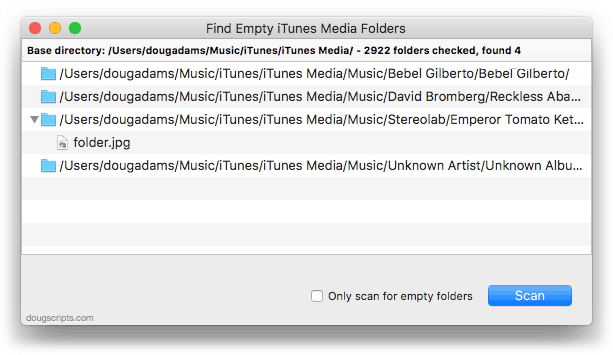 But, if you manage the iTunes Media folder yourself (or some other folder/s that store your media files) and delete tracks and files, I’m not so sure iTunes will delete the empties. 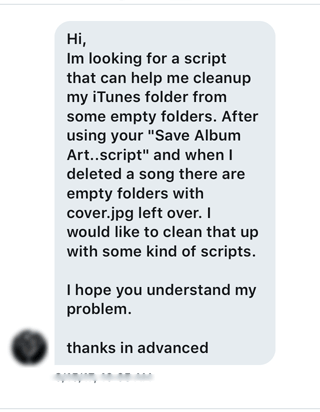 Or, if, like the author of the tweet, you’ve placed files alongside your media that iTunes doesn’t recognize—set lists or liner notes as text files, album art as “folder.jpg” or “cover.jpg” files, and so on—then iTunes won’t delete these folders either. My guess is that if you’ve Trashed the media files, you probably don’t need the associated bric-a-brac anymore and these folders could be disposed of. 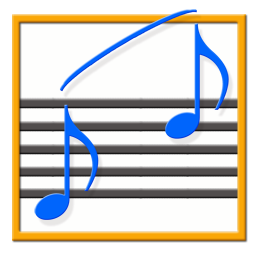 Short of going through the entire iTunes Media folder using your fingers and eyeballs, Find Empty iTunes Media Folders will quickly traverse the iTunes Media folder looking for empty folders and folders that only contain files that iTunes doesn’t recognize. I wish I had taken a screenshot of the folders it found before I really started testing the delete feature. I originally had about thirty folders either empty or containing potential jetsam. If you like and use the app, you can purchase a registration code for $1.99 that will remove the Demo Mode restrictions and enable the features listed above. You can get more information and download it from this page.